Would you fancy spending eternity inside a burial chamber in the corner of a field in Wiltshire? I do! 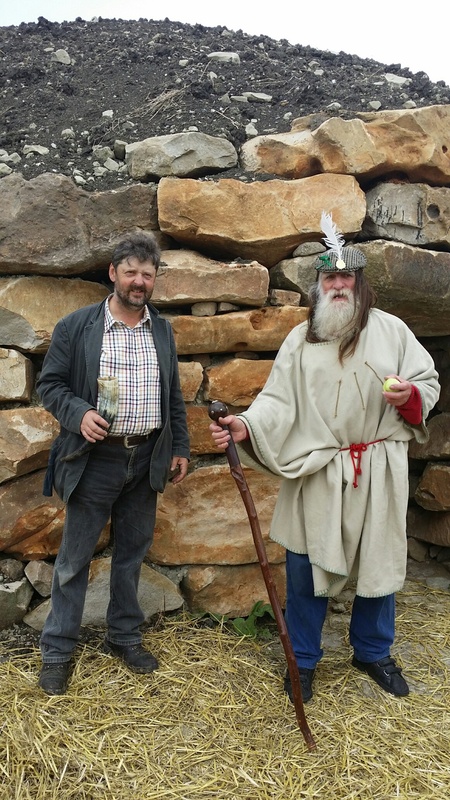 The first “Neolithic” long barrow to be built in the UK for 5,500 years has been completed and already the first urn of human ashes has been placed inside. The structure at All Cannings near Devizes, took almost nine months to build, using traditional materials and stone working techniques. The tomb, designed by farmer Tim Daw, has been positioned to let the midwinter sunrise shine right down the length of the chamber where people’s ashes will be placed in urns set into the walls. What is a long barrow? We intend to include the Long Barrow on future tours and I have already booked a niche. 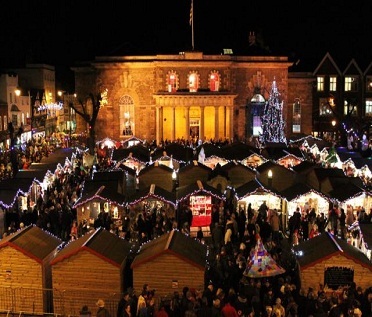 Salisbury will be hosting yet another Christmas Market promising some wonderful stalls, perfect for all your Christmas shopping, in the historic setting of the Guildhall Square. Come to Salisbury’s lovely and very British Christmas Market! Rated by the Daily Telegraph in 2013 as one of the ‘Top 5 Christmas Markets in the UK’, we believe you will find it to be one of the most attractive and enjoyable Christmas Markets in the country. During the Christmas Market there will be a programme of local choirs and music groups performing festive music, with many retailers in Salisbury organising additional special events. In addition to our colourful Christmas Market, Salisbury holds it’s traditional and vibrant Charter Market in the central Market Place each Tuesday and Saturday which incorporates a local Farmers’ Market too. In addition a Farmers’ Market is held every Wednesday at the Poultry Cross. Take a stroll to Salisbury’s beautiful Cathedral Close and admire the grandeur of the surrounding buildings before visiting Salisbury Cathedral – if you are feeling active why not take a trip on one of the popular tower tours to find out more, and be rewarded with a most magnificent view of Salisbury from high. Follow this with a visit to the multi-awarding winning Salisbury & South Wiltshire Museum to discover more about the history of this medieval City. Why not find out more about this medieval City by taking part in a guided walk that leaves Salisbury Information Centre in Fish Row every Saturday and Sunday at 11am. For more information on what to see and do, and where to stay please visit Salisbury Information Centre, Fish Row or call 01722 342860. Private guided tours of Salisbury and Stonehenge. WILTSHIRE DOWNS, England — Standing at the center of the Stone Circle of Stonehenge in the moments before dawn, lulled by low-hanging rain clouds, I am, for a while, unable to understand why so many pilgrimages have been made here. Sure, the setting is attractively pastoral, with gently rolling fields and dark patches of trees on distant hills. But the vista verges on the ordinary. I can even make out the line of a highway not far off, cutting across the meadows, commuters’ headlights poking through the mist. In the half-light, the surrounding stones seem almost familiar and scarcely mysterious. Is this really the place that Thomas Hardy called “a very Temple of the Winds,” describing it “rising sheer from the grass,” its stones seeming to hum with sound? Did Christopher Wren, the great architect of St. Paul’s Cathedral in London, really think so much of Stonehenge that he left his signature chiseled in one of the stones? And why should this site now lure as many as 18,000 celebrants to a summer solstice festival on the day the sun rises through a gap between its central stones, bisecting the monument? But after the rain, when the sun breaks through the clouds and the pillars of rock cast corridors of shadow, all misgivings are cast aside. In the privileged calm of early morning – an enviably timed visit that can be arranged with English Heritage, the government agency that manages the area – I begin to understand why more than 1 million visitors a year are drawn here. I see, too, why its nearly completed $44 million transformation has been so celebrated. The renovation has eliminated a highway that nearly abutted the stones (leaving intact, at least for now, the heavily trafficked road some 500 feet away). And it demolished a similarly intrusive visitor center, replacing it with another a mile and a half away, invisible from the monument, designed by Denton Corker Marshall to appear delicately self-effacing even while enclosing an introductory exhibition, a cafe and an extensive gift shop. A shuttle transports visitors to the main attraction, which requires tickets, typically costing about $25, for entry at a specific time or about $35 for “out of hours” stone circle access. This touristic enterprise also involves a kind of restoration. The goal is not to restore the stones themselves. That would have been impossible, even in the 12th century, when the earliest known history of Stonehenge appeared (in a volume now on display at the visitor center): Constructed by a race of giants, it was transported to its current site by the wizard Merlin. The goal now is to restore the landscape, which researchers have been examining recently because of its intimate connections to the site. This emphasis can be felt throughout the new visitor center. A 360-degree theater uses finely detailed laser scans of the stones to show the monument’s evolving shape, while a wall-size animated map shows Stonehenge within a puzzling network of mounds and ditches, barrows containing burial remnants, and vestiges of unexplained earthworks that extend for miles. Display cases show some 300 artifacts that outline the region’s varied modes of life and death during the site’s evolution. A similar emphasis is evident in the elegant new $4 million Wessex Gallery, at the nearby Salisbury Museum, which gives a reverse archaeological history of the region, proceeding backward in time. Its 2,500 artifacts – including the Stonehenge Archer, a skeleton dating from as early as 2400 B.C., found in a ditch in 1978 – are accompanied by images of a pastoral landscape that still holds unexplored secrets. I am also preoccupied with the surrounding landscape that morning, standing within the Stone Circle. It is an enclosure that leads us to look outward. During the hours of sunrise (and sunset), when shadows are long, the patterns change every moment. The shadows of the stones hug the ground, climb neighboring pillars, slide over nearby ditches. 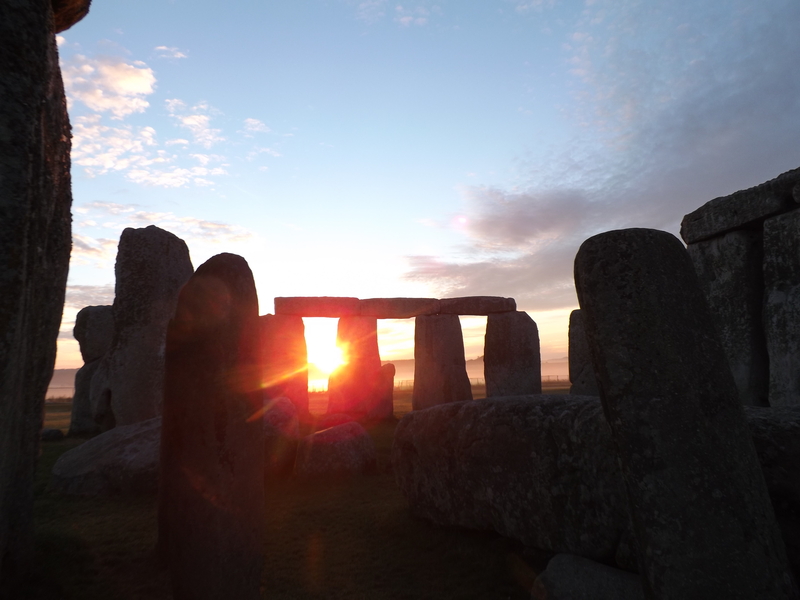 The axis of Stonehenge was originally determined by the sun’s rising and setting during summer and winter solstices, when symmetrical movements of shadows must have been something to behold. But even visiting at another time of year, I feel as if I were in a languorously turning kaleidoscope. The stones provide a medium through which we perceive the landscape. We emerge, entranced by the expanse around us, attentive to its details. The site reveals the setting; the setting, the site. At first, the landscape seems a nondescript series of meadows; now it becomes far more intricate. Look toward the northeast, and you clearly see faint traces of the Avenue, an ancient earthwork path that extends 1.5 miles, ending at the River Avon. One hypothesis is that the river was used to transport the stones of the inner ring (called “bluestones”) which came from Wales, some 150 miles to the west. I walk across these fields and become aware of dips and banks, ridges and mounds: eroded remnants of ancient human activities, many seemingly related to the monument. Recently, the remains of a Neolithic human settlement were discovered at the Avenue’s other end, near a circular timber counterpart to Stonehenge. During the recent restoration, natural rock fissures were discovered beneath the Avenue that are aligned with Stonehenge’s solar axis and may even have determined the monument’s location. In an article in Smithsonian magazine this month, “What Lies Beneath Stonehenge,” Ed Caesar describes the latest explorations using three-dimensional GPS-guided measurements that have revealed new subterranean features. The temptation is to think of Stonehenge as a “thing,” a monument erected at a particular time with a particular purpose. Yet displays here suggest that over the 1,500 years or so that the site was in use, cultures and rituals changed along with it. One of the intriguing things about Stonehenge, as we are reminded again and again, is that it can’t really be pinned down; we will never know enough. Was it a burial site, a temple, an astronomical model, a healing center, a monument to the ancestral dead? We are destined to feel unsettled, even after learning from the fine exhibitions nearby. In J.M.W. Turner’s 1827 watercolor of Stonehenge, on display in Salisbury’s Wessex Gallery, lightning strikes near the center of the Stone Circle. The flash is luminous, exhilarating. But dread mixes with illumination, mystery with enlightenment. Why is the outer ground littered with the carcasses of shepherd and sheep? A bolt from the heavens? We aren’t certain. It is a bit frightening, which makes the painting as uncanny as the place.